PJFRFC Marlins did well to get to the play-off final, though had a formidable opponent in a youthful Old Caterhamian side. Marlins boasted a strong veteran front five, and set out to dominate the scrums from the outset. Marlins utilized their big forwards well, and “camped” in the opposition half for most of the first 25 minutes. Front row forwards-Jim Brannigan, Simon Mander and Tom White made their presence felt, this put Old Cats on the back foot, and PJFRFC enjoyed several minutes of attacking rugby. Old Cats seemed quite surprised by the mature and mobile front row, who kept the ball in hand for long periods, utilizing all the known trade secrets. 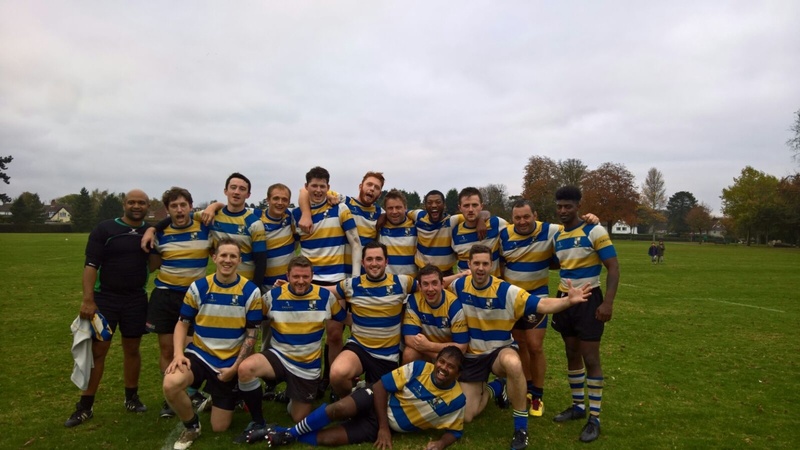 The break downs were ferocious, and Old Caterhamians threw bodies on the line to stop Kareem, Neil Leather, Matt O’Brien and Nick Ward from making the last few yards to the try line. Though the school leaver Nick Ward, playing open side, was the one to watch, carving out the opposition defence, unlucky not to score, having dragged the opposition pack on his heels, in a Herculean effort! The under pressure Old Cats pack did well to prevent push over tries, from a couple of five yard scrums, in close succession. PJFRFC Marlins lost the ball in contact, and Old Cats launched a counter-attack from their 22 and scored to lead 7-0. PJFRFC, again struggled to convert the pressure into points, despite dominating scrums and competing well in the line-outs, and having the majority of the possession, and playing good open rugby. Again the under pressure Old Cats pack were penalized and Will Walters, kept slotting the penalties into the corner, and Neil Leather was able recycle ball back to the PJFRFC back line, and Matt O’Brien and Reem kept up the pressure on the Old Cats back line, though recycled ball ricocheted off a PJFRFC player and Old Cats again pounced on the spilled ball to score, and lead 14-0, at half time. PJFRFC, made some changes at half time, though the dominant front five kept up their appearance. A resurgent Old Cats were keen to stamp their authority, and PJFRFC Marlins did well to defend aggressively, with Nick Ward, Neil Leather, Reem, Matt and Jules dampening their strides, with some excellent shackling tackles. PJFRFC stuck to their strength and recycled ball through their forwards, and made 30-40 yards, though seemed to fall foul of the referee, at the last hurdle, and giving away penalties in the final 10 yards. This led to a counter-attack by Old Cats, and a keen Old Cats winger linked well with the forwards to score out wide, and lead 19-0. Marlins, came straight back with some excellent rucking through Jim Brannigan and Mander, and some incisive running from Reem and full back Damo. The forwards kept up the pressure, and the under pressure Old Cats pack, struggled to compete at breakdowns, leading to spilt ball. On this occasion, PJFRFC pack drove Old Cats over the line to score, through Will Walters, and fight back 19-7. Nick Ward was sin binned, soon after, due to, what was deemed an infringement in a ruck, and Old Cats, utilized this to their advantage to score from a line-out, and lead 24-7. PJFRFC Marlins kept fighting to the end, attacking through their talisman Reem and step in Full back Damo, though just couldn’t find the finishing touch. Old Cats added a penalty to their score in the last few minutes to finish 27-7. Marlins would be pleased with the runner-up trophy, and have finished in the top three, two seasons in a row, though would feel a little hard done by the gods, despite all the hard work, consistency in crucial positions let them down. Till next season, adios!